Have you heard the latest news? Shopify, the e-commerce software company from Canada, got a huge vote of confidence from e-commerce giant Amazon. Now you can sell your goods on Amazon with Shopify. Moreover, Amazon is advising its users to move their stores to Shopify. Could you imagine such a partnership? Seems, Shopify is gathering momentum. Earlier this year, Facebook announced that they are working with Shopify merchants to test the ‘Buy button’, which will allow them to sell goods directly from Facebook. What is more, Shopify is also negotiating with Twitter in order to launch the same ‘button’. But that's another story. What about selling on Amazon with Shopify? The plans for integration of two platforms were first negotiated in September 2015, but it was made public until now. This a long-awaited integration with the world's biggest marketplace is aimed to connect Shopify’s large merchant base with “millions of potential Amazon customers” and increase their sales rapidly by reaching new extensive audiences. Applying the multi-channel approach for your eCommerce business became easier. 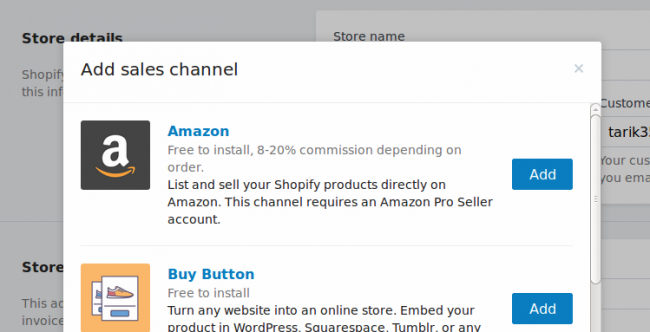 Now you are able to add Amazon as a Sales Channel in your store and create Amazon listings from existing products and fulfill orders directly within Shopify admin panel. Shopify will also sync your available inventory within all active sales channels. With the snapshots of your top stock keeping units and shipping costs made within multiple channels, you'll get the fullest picture of your business performance. However, there's a pitiful (and hopefully temporary) limitation cited by Shopify rather unwillingly. Currently, you can sell on Amazon with Shopify only if your products fit the Clothing and Accessories Amazon category. Even so, you can create Amazon listings for other goods directly on the marketplace and then link them to Shopify store. Another great news is that Shopify mentioned they would add the support of “Fulfillment by Amazon” - a long-anticipated feature thousands of store owners were waiting for. Harley Finkelstein, Shopify’s chief platform officer, cited that most of Shopify's existing 175,000 merchants use Amazon as a sales channel, so it makes sense to let these retailers use Amazon payments. The experts admit that the ability to integrate and partner with major players in the industry — like Amazon and Facebook — is one of the reasons for the Shopify’s popularity nowadays. Your Shopify account should be active. You should be selling goods that fit the Clothing and Accessories category. Now you are able to create only listings for Clothing and Accessories category, but you can still create Amazon listings for other categories directly on Amazon and then link them to your Shopify store. Your store needs to have prices in USD. Log in to your Shopify and click + icon next to "Sales Channels" and find Amazon here. Then click ‘Add’ to confirm. In order to sell on Amazon with Shopify you have to register as a Professional Seller and upgrade to an Amazon Seller Central Professional account. Open the Amazon Services and click ‘Start selling’. Here you will have to fill in your name, email address, and choose a password to create your seller’s account. After creating the Professional Seller Account you need to get the approval from Amazon that your products fit the categories. If you are not already selling goods on Amazon in the Clothing and Accessories category, you are able to create your products listings from Shopify Admin panel. If you are already selling on Amazon in any of categories, you can claim existing Amazon listings in your Shopify store. The listings from your Professional Seller's Account will be noticeable from your Amazon Listings page in Shopify. You are able to use your store’s inventory settings for every Amazon listing in Shopify, or you can choose the manual managing of your Amazon inventory. Congrats! Now you can Start Selling on Amazon with Shopify and reach new audiences. Shopify is growing extremely fast and currently as a leading online shop builder it is powering more than 370,000 online stores and has helped businesses process over $29 billion worth of sales. If you are still not using Shopify as the platform for your ebusiness, believe us, you’re losing a lot. But everybody knows that ‘when there is a will, there is a way’. Your current shopping cart solution can be easily switched to Shopify by using Cart2Cart. Cart2Cart is the world’s #1 and industry leading shopping cart migration service which performed over 30,000 successful migrations. It lets you to migrate your store’s data from than 75 eCommerce platforms to Shopify with no programming or developer services needed. This service will move products, orders, customers, categories, product images and variants, CMS pages and other related entities automatically. In addition, you can check the approximate cost of migration via online Cart2Cart estimator. What is important, Cart2Cart provides customers with 24/7 Support and Assistance , that means the staff is always there for you to provide answers on any migration-related questions and help get to your destination shopping cart quickly and safely. 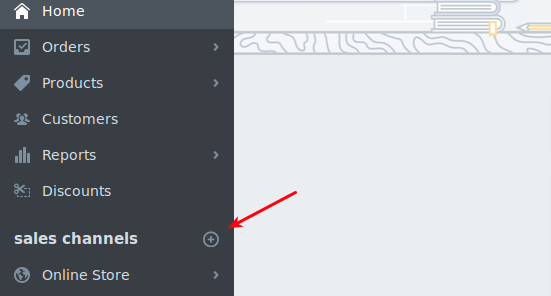 If you want to switch your platform for Shopify all you need is to follow the few steps below. How to migrate to Shopify? Click here for more details on Shopify import. The whole migration process will take a couple of hours but it will not affect your current store performance - users will be able to make purchases during the whole process of data transfer. Take a look at your new Shopify store right away with the Free Demo migration offered to you! 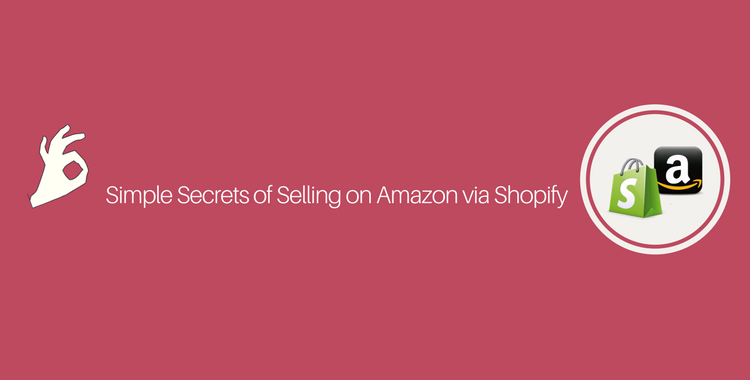 2 thoughts on "Simple Secrets of Selling on Amazon via Shopify"
Currently, Cart2Cart does not support Shopify data import to Amazon store but we’re planning to do it in the nearest future. We’ll contact you once the necessary functionality is developed. Thank you for contacting us. Hope to hear more from you!